I love pointing out interesting phenomena. Just take a look at the post about Fibonacci for an example. One thing I have noticed about myself is that I tend to over-explain, so I have tried to get out of the habit, and just allow children to explore those things on their own terms. 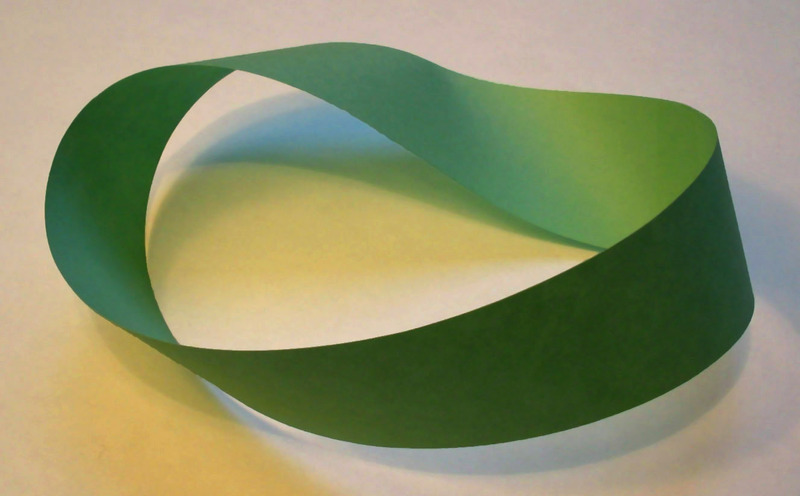 Have you ever seen a möbius strip? It's "a surface with only one side and only one boundary component." That's right: a real, three-dimensional object you can hold in your hand, with only one side and only one edge. You can even make one out of paper! It's a loop of paper with one half-twist in it. Show it to a kid, and you'll probably get a less-than-super-enthusiastic response. So what? It's a paper loop. Have the child cut the loop in half lengthwise, and they'll have a strange situation on their hands: you end up with one loop that's twice as long, and half as wide. Cut it again, and the same thing will happen. Do the same thing, but this time put a full twist in the paper and cut it in half. I won't give away the result here, but try it for yourself. Really do it. It'll take a minute of your time, but it might make you think a bit about what's happening. That's what you're going for with your students: they'll need to think about what is happening. Ask them the questions. Let them teach you about what's going on. I think you might enjoy it. Oh yeah, there's a plan for it, too. Don't think I would leave you to figure out everything on your own! That's not what I'm here for.